Tonight is the Cincinnati Reds’ first night game of the season, and the team has turned it into quite the event. For Opening Night, players will walk a red carpet and provide autographs to fans, the broadcast crew wears tuxedos, there’s a team calendar giveaway, and after the game there are fireworks. It’s a fun time, and I’ll be sad to be missing it for the second year in a row. But I’ll be at home, watching as the St. Louis Cardinals send Michael Wacha to the mound to try to avoid a sophomore slump. 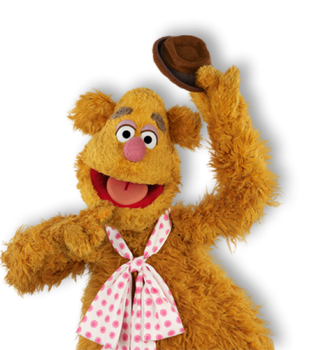 Of course, I’ll be envisioning Fozzie Bear everytime he’s shown. In honor of that, here’s some of Fozzie’s best worst jokes. 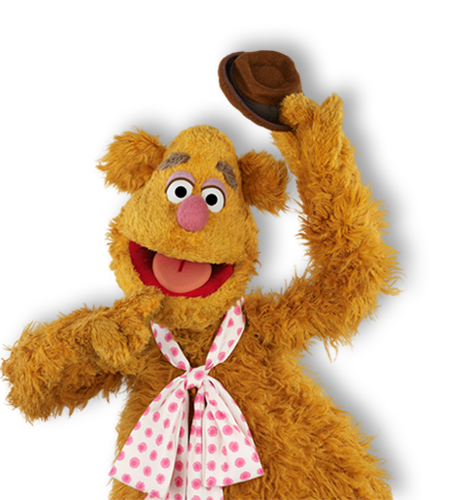 Fozzie: OK, so a guy asks me ‘Did you take a bath today?’ and I said Why is there one missing? Wacha Wacha Wacha! Fozzie: What do you get when you put chocolate pudding in your mother’s shoes? Give up? You get a spanking! Wacha Wacha Wacha! Fozzie: Why do movie stars have lots of fans? Give up? Because they’re HOT! Fozzie: What did the big dragon say to the mouse? Give up. Nothing! Dragons can’t talk! Fozzie: Did I tell you the one about the man with the light bulb in his nose? He was lightheaded! Get it? Wacha Wacha Wacha! Fozzie: Why are fish so smart? Give up? ‘Cause they swim in schools. Fozzie: Why did the man put a sweater on his hot dog? Because it was a chili dog. Wacha Wacha Wacha! 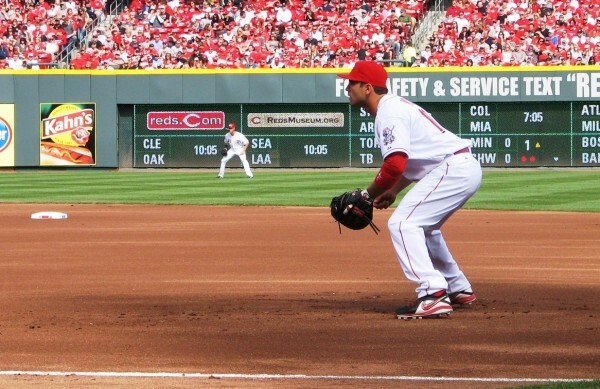 Hopefully, the Reds’ offense will have a presence in tonight’s game. While they’re continued absence could become quite a joke, it would never be as endearing as Fozzie. The first pitch is scheduled tonight at 7:10 pm. 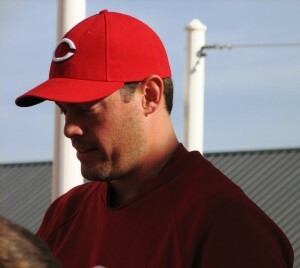 Posted in Cincinnati Reds, NL Central, St. Louis Cardinals. 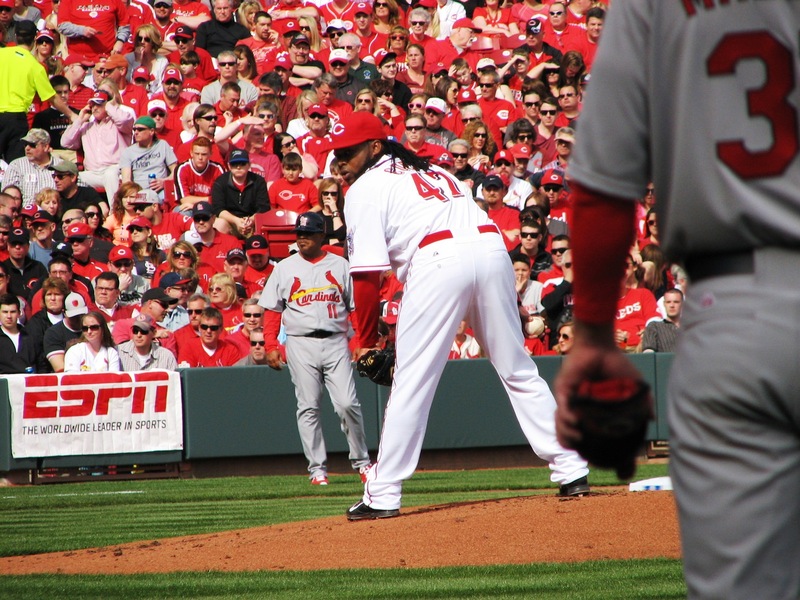 The RHM crew had a surprise offer a few days before the Reds’ Opening Day: a couple first-base side tickets right near the dugout to see the Reds try to beat the Cardinals. It was too amazing to turn down. We arrived a couple hours before the stadium’s gates opened and headed to the Moerlein Lager House to enjoy the wonderful weather in the outdoor park adjacent to the restaurant. 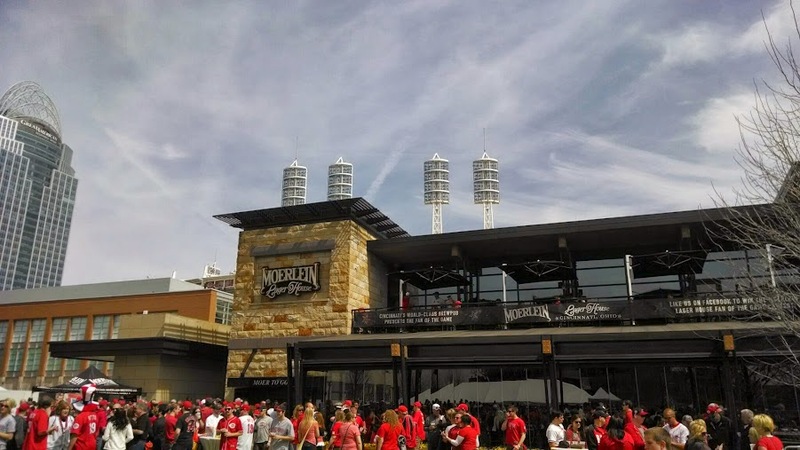 The Great American Ball Park light stacks appear above the Moerlein Lager House. A few Moerleins and Hudepohls later, we headed into the stadium and found our seats. They were excellent. 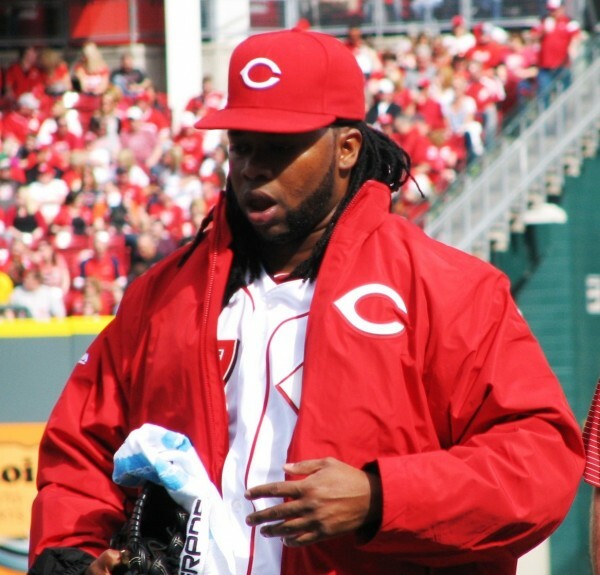 Cueto jogs to the dugout after warming up. 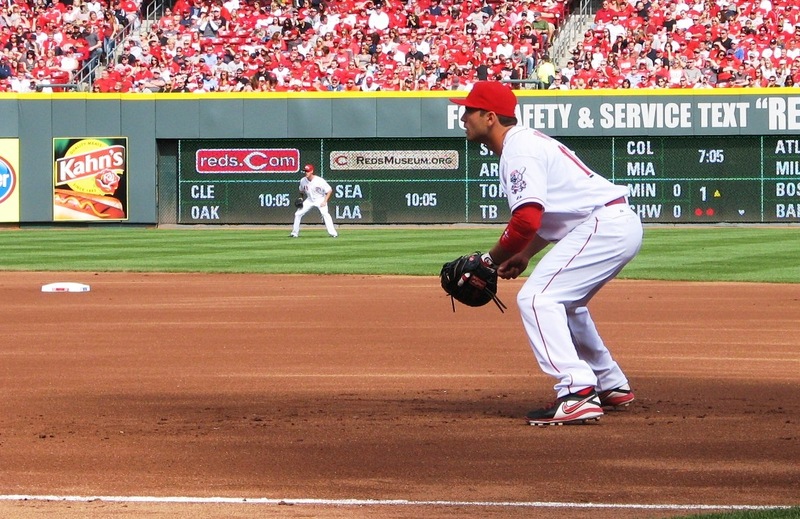 Votto crouches at first as the pitch is delivered. Tony LaRussa was elected to the Hall of Fame yesterday, along with Joe Torre and Bobby Cox. LaRussa is the first manager or player from the much-maligned steroids era baseball to be elected to the Hall. This election was not performed by the Baseball Writers of America, as the most popular results are. Instead it was done by a Hall of Fame Baseball committee charged with electing managers and overlooked players. 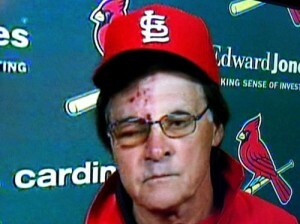 LaRussa won a total of three World Series as manager, one with the Oakland A’s and two with the St. Louis Cardinals. Posted in NL Central, St. Louis Cardinals.